On Wings of Eagles: Will you let God fix the cracks in your life? What is the first thing we do when injustice happens to us? Don't we try to rectify it through our own ingenuity and effort? And how do we react if we fall into temptation of any kind? Don't we try to make up for it by performing better? Isn't our tendency to try to show God how sorry we are? Don't we savor working harder and making great sacrifices to show our sincerity? Reality hits hard when we realize that addiction cannot be overcome in this manner. Nor can we pursue a satisfactory solution to any of the injustices committed against us on our own! We can't fix the problems on the inside by putting Band-Aids on the outside! Our God does not delight in such sacrifices, for they are really meaningless, no matter how sincere we may be. Only when we fall on our knees, completely broken inside, will we have a hint of hope and true salvation. Only when we cry to God for help, realizing that we can't do anything about our circumstances, will the Son start to shine on us and hope will be birthed. This is what Jacob experienced firsthand when undergoing total anguish in complete solitude. During the 147 years he lived on earth, 95 of those years were spent weaseling his way out of precarious situations, putting all of his effort into serving himself. Yes, he did experience God in Bethel, but his acceptance of God was conditional and self-serving. Only on his way back to Canaan, when he had to face his brother from whom he had stolen his birthright through trickery, did he realize that no matter what he did, his situation was hopeless. He had planned several scenarios to get out of this trouble, and his last decision of sending a multitude of gifts to his brother ahead of him, followed by his entire family, left him completely alone and desperate. He began to realize that all of his manipulations would not serve to save him from his dire circumstances this time! That day Jacob was completely broken, not only physically, but also deep in his heart. He realized that he was desperate. He finally recognized that he had no control over his circumstances. That was the day he relinquished all control to God, and that was the day that he was radically changed. God even changed his name: "Your name will no longer be Jacob, but Israel, because you have struggled with God and with men and have overcome." (Gen 32:28 NIV) He was no longer Jacob, the "deceiver". Instead, he was Israel, "God fights". Hope now filled him, and this hope bore fruit when he had a peaceful reunion with his brother. All throughout the Bible we encounter people who have been completely broken of their self-reliance. These are the ones who became heroes of the faith. In life, we notice many examples of the benefits of brokenness. Take a seed for example. It won't grow until it dies and is buried in dirt. But once it grows, its fruit is delightful! In Hveragerdi, Iceland we discovered a popular library. Hveragerdi is a tiny, ordinary town with a population of 2,316, but the traffic in this particular library is far more than would be expected from such a small town. There are many books in the library, and it also hosts a tourist information center. But what really attracts tourists to this library is the large fissure running through its floor. The crevice is caused by an oceanic rift. It has been covered with Plexiglas, and is therefore safe to walk on, giving the library the distinction of being one of the only places on earth where you can actually walk over an oceanic rift! Thus, this "broken" library attracts more people than a typical library would! 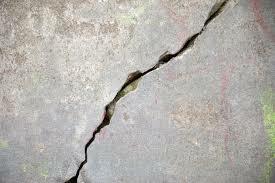 But remember that covering cracks (even within our inner self) will not make these cracks mysteriously disappear. There is only One who can turn these into triumph! Dear Lord, we thank You for the power You have over all circumstance and troubles. Help us humble ourselves and let You fill the cracks in our life. In the Name of Jesus, Amen.